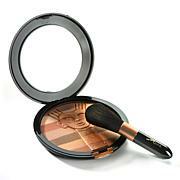 Anti-aging matte bronzer that delivers a face-perfecting vitality glow and airbrush effect. Comes with The Heavenly Luxe Mega Fan Brush for flawless application. Extract, Hyaluronic Acid, [+/- Iron Oxides (CI 77499, CI 77492, CI 77491)]. 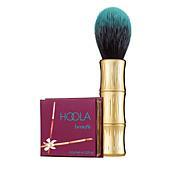 I Love this bronzer and the brush is fantastic. goes on great!! Benefit Cosmetics Hello Happy Soft Blur Shade 10 Foundation/Brush AS® What It Is This light-medium coverage liquid foundation broad spectrum SPF 15 sunscreen works for all ages and skin tones. 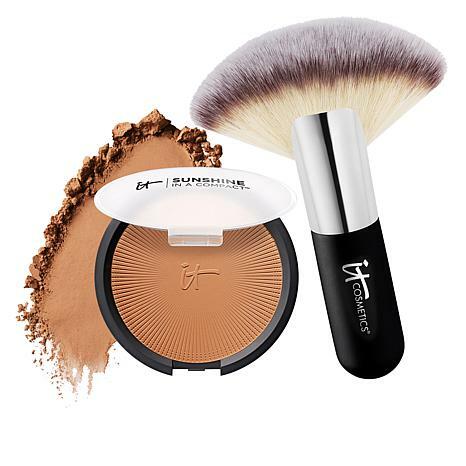 It comes with a foundation brush to ensure perfect application of the product. What You Get 1 fl.